World Wildlife Day will be celebrated in 2019 under the theme “Life below water: for people and planet", which aligns with goal 14 of UN Sustainable Development Goals. The ocean contains nearly 200,000 identified species, but actual numbers may be in the millions. Globally, the market value of marine and coastal resources and industries is estimated at US$3 trillion per year, about 5% of global GDP. Over three billion people depend on marine and coastal biodiversity for their livelihoods. Marine wildlife has sustained human civilization and development for millennia, from providing food and nourishment, to material for handicraft and construction. It has also enriched our lives culturally, spiritually, and recreationally in different ways. The capacity of life below water to provide these services is severely impacted, as our planet’s oceans and the species that live within it are under assault from an onslaught of threats. As much as 40% of the ocean is now heavily affected by the most significant and direct threat of over exploitation of marine species as well as other threats such as pollution, loss of coastal habitats and climate change. These threats have a strong impact on the lives and livelihoods of those who depend on marine ecosystem services, particularly women and men in coastal communities. 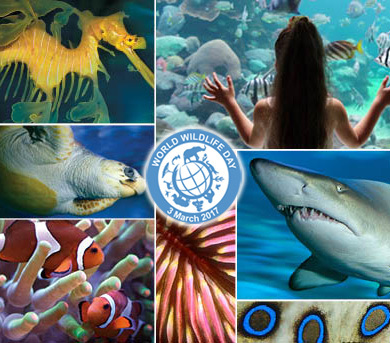 This is the first World Wildlife Day to focus on life below water. It is a great opportunity to raise awareness about the breathtaking diversity of marine life, the crucial importance of marine species to human development, and how we can make sure it will continue to provide these services for future generations.